Skagway, Haines, Whitehorse, Haines Junction, and Juneau make up the Golden Circle. Skagway is an excellent place from which to base your travels while in the upper Lynn Canal. From here you can travel daily to Haines or Juneau by water or air. You can leave your vehicle behind or take it with you and see another part of Southeast Alaska! The Klondike Highway from Whitehorse to Skagway is an excellent year-round road designed to handle all types of recreational vehicles. Many travelers are pleasantly surprised at how easy it is to arrive in Skagway after a leisurely drive over the Klondike Highway from Whitehorse. Don’t forget fuel is generally less expensive in the United States. May is still a secret in Southeast Alaska, particularly in Skagway. Most attractions and services are available. Likewise September can feature great weather, smaller crowds and end of season bargains in many shops. Located at 291 Broadway St in Skagway, this Visitor’s Centre is the gateway to the Klondike Gold Rush National Historical Park, which commemorates the 1898 Gold Rush. Visit the Visitor’s Centre to enjoy a Ranger Presentation, watch the 30-minute film “Gold Fever: Race to the Klondike,” explore the Mascot Saloon, and visit the historic Moore House and Cabin. There is a lot to experience in and around Skagway. 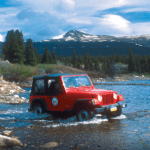 You can explore White Pass and the Yukon by Jeep, learn the art of gold panning and sit down for grilled wild Alaskan salmon in Liarsville. Click here for five ways to enjoy Skagway!